Fits 1970-71 Ford vehicles with the 351 4/V engine requiring premium fuel. 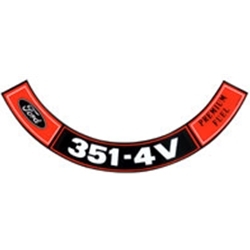 This decal is applied to the front-facing edge of the top of the air cleaner assembly. This is a very high quality reproduction not genuine Ford.